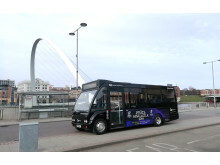 The award-winning bus operator has been named transport partner for the Newcastle Falcons, ahead of the highly anticipated 2019 European Club Rugby Finals being hosted in the city in May. 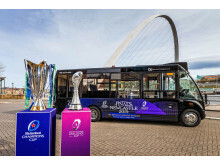 A special Go North East branded minibus will embark on a three-week, 50-event Newcastle 2019 Trophies Tour, taking the prized silverware to rugby clubs, schools, businesses and public events across the region. The vehicle will transport the two trophies, staff, volunteers and the Falcon’s official mascot – Stephen the Seahorse – to events between Friday 22 March and 14 April 2019. 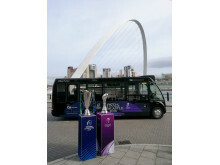 Journeying from Middlesbrough to Newcastle, up to Berwick and the Scottish Borders, the Tour will give fans the opportunity to have photographs taken with the trophies - and be in with a chance to win tickets to the finals. In total the silverware will visit 12 schools, 11 rugby clubs, 11 community/public events, five businesses and major sporting fixtures at Newcastle United FC, Middlesbrough FC, Newcastle Eagles basketball, Newcastle Falcons and the Melrose Sevens. As the official transport partner, Go North East will also be carrying officials and sponsors during the finals weekend on 10 and 11 May. 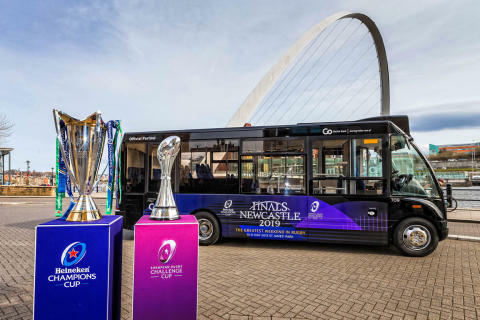 Mark Ellis, Go North East's Business Development Manager, said: “The Tour is an excellent opportunity for Go North East to join rugby fans across the region and beyond, in celebrating a hugely exciting event. Our vision is ‘journeys taken care of’ and we’ll certainly be taking good care of our precious Cup cargo.